Earlier this week, we chatted with him about his love for those values, the transition between continents, and his thoughts for the future of Maryland County. Q: How would you describe Liberia, and Maryland County specifically? You can look at Liberia two ways. On the one hand, it is still a poor country, still has a lot of challenges around its health indicators. To make it simple: About 1 in 28 women die of maternal causes. At the same time, you have a generation of young people who want to learn, want to know. And when you work with them, you can see hope. They are open to learn, they are ready to make a change. Maryland County is a beautiful place. When I say a beautiful place, I mean a beautiful place. The beach. The palm trees. The forest. I’m from the Caribbean, but I would pay for a vacation in Maryland County. Q: How are the challenges in Haiti different from those in Liberia? One of the big difference is HR. In Haiti, we have a lot of human resources available—training, schools, all those things—which are not available in Liberia. But I’ve been working for PIH for so long, being in Liberia is sort of like déjà vu. I see the challenges and know that if we do what we need to do, we’ll be where we need to be. Q: What are the central challenges in Maryland County? Supply chain at the county level is challenging (especially regarding road transportation and management), however, we are working together with the county health team to improve the situation. So is the lack of human resources available in the country and county. But maternal death is still on the top of the list. We still have a lot to do, but we are making progress. And even small improvements have a big impact. For example, if I train all the midwives in Maryland County, if I give them all a refresher, this has a big impact on the quality of care they can provide for pregnant women (they call them “big belly” women). And how much does it cost to do a training? It’s small compared to the impact. Q: What’s the team like? The team is great. We have a lot of folks who worked for PIH before as part of the leadership, so it’s easy to make decisions and move forward with the same vision. We also have newer staff that have came on board in Liberia, so PIH's values are only proliferating. After that, the partnership we are building with the Ministry of Health—it’s great. We have a director of policy and partnerships working inside the Ministry of Health and we share all our outcomes weekly. That’s why more than 20 percent of our funding is from partnerships established directly in Liberia. We are accompanying the Ministry to run the new ward for patients with drug-resistant tuberculosis, which will open in Maryland County soon and will be the first such ward outside of the capital. And that was the decision of the Minister of Health, who said, given PIH’s years of experience working on MDR-TB, we were in the best position to partner with them. Since February, we've supported the county health team in opening a new HIV clinic in Pleebo Health Center, which has enrolled 65 newly diagnosed patients. (Approximately four patients test positive every week.) And after eight months of the community health program, the rate of tuberculosis patients who default has dropped from 77 percent to 12 percent. 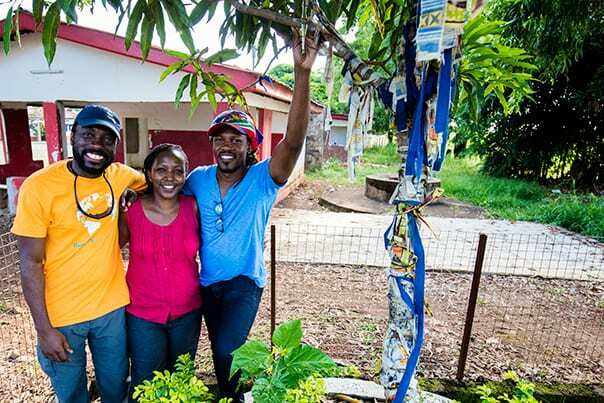 stand near the discharge gate of a decommissioned Ebola treatment unit in Sierra Leone. Q: You’ve worked at, or in concert with, other development, emergency aid, and health organizations. What sets PIH apart? PIH is different because we don’t accept ‘no.’ We always try to figure out a way to save a patient’s life. The drugs aren’t available? We try to get them. A service isn’t available? The patient is transferred. PIH is also exceptional because, thinking of Haiti, we built a generation of physicians—physicians who, when they see a patient, they don’t just see a disease or pain, but the patient’s living situation, the patient’s social challenges, the patient’s emotional health. PIH trains you to see the patient in his entirety, and to value that entirety.